Natalie wanted to see why Scandinavia always rated as one of the happiest regions of the world to live! She conquered this area as a solo traveler while Josh was back in the US for a wedding. While exploring Copenhagen, Oslo, Gothenburg and Stockholm, she consistently rode on great public transport, explored safe, well-planned cities and sat on sleek, modern designed furniture. It is the land of cinnamon rolls (Kanelbulle), hot cocoa, salmon, sleek fashion and high prices! 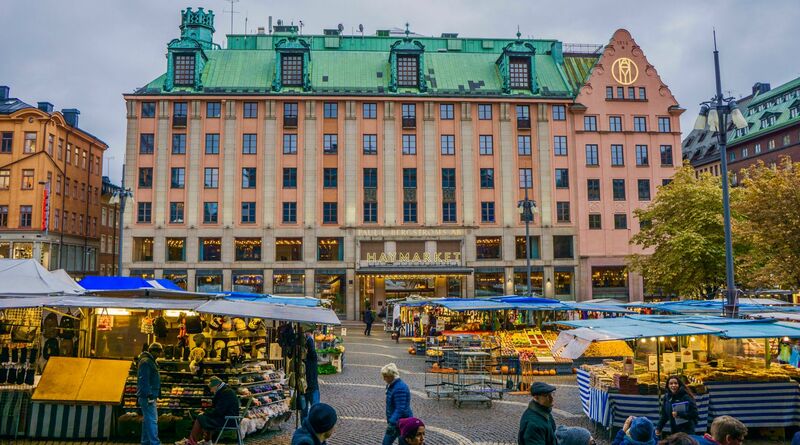 Enjoying the Haymarket in Stockholm, Sweden. Natalie was surprised by a few things… very few blonde-haired locals, a “Fika” culture of Kanelbule (cinnamon rolls) with coffee, healthy convenience food (even paleo and vegan options at the Seven Eleven), and both adults and kids whizzing around in razor scooters. Scandinavians are confident, sleek and cool. They are always within the top coffee-consuming nations in the world - likely due to the colder climate and increased hours of darkness. 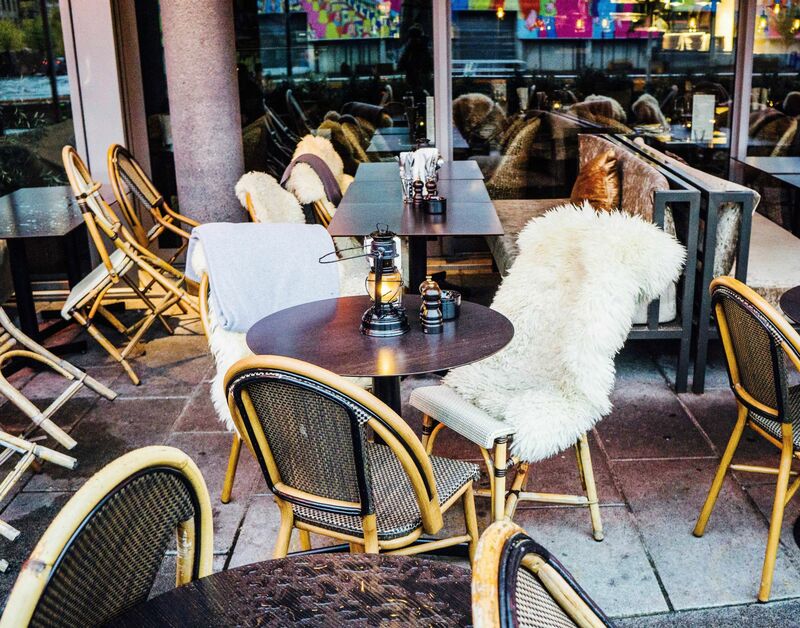 The cafe culture of Scandinavia. Scandinavians often relate their high happiness factor to the following perks: free education, comprehensive health care and abundance of outdoor activities. Scandinavia is a great place to live and work, however, it is one of the most expensive places in the world to travel due to the relatively high wages, low unemployment and not to mention the North Sea oil market. To start the journey, Natalie hopped a bus from Hamburg, Germany up to Copenhagen, Denmark- passing green countryside and wind farms en route to the hostel (hotels are very pricey there)! Copenhagen is a great city to walk around in- it has many attractions that couldn’t be more different from each other! Tivoli Gardens was the first amusement park ever created and inspired the creation of Walt Disney World. Freetown Christiania is a self-governing squatter area within Copenhagen that caters to hippies, squatters, anarchists, and druggies. Nyhavn is the picture perfect 17th century waterfront area with colorful buildings, restaurants and many boats. This city definitely has a pulse no matter what area you are in! After exploring Copenhagen, Natalie hopped on a bus that drove inside a ferry….yes, the bus ticket included a ferry ride (while riding in the bus)! More interestingly, trains also ride on tracks into the ferry, cross the Baltic, then link up with train tracks on the other side of the sea…pretty interesting to watch! After the bus-ferry ride, she arrived in Gothenburg - Sweden’s 2nd largest city with a university feel to it. The city is proud of it’s Haga district- a trendy, hipster neighborhood with great coffee and kanelbules (cinnamon buns, which were invented in Sweden)!!! Many young moms with high tech strollers can be found in Haga navigating the cute cafes in search of giant Kanelbules! Many locals enjoy “Fika” which is an afternoon meeting with a friend over a coffee and a Kanelbule- delicious! Gothenburg has a beautiful park, river walk and interesting fish market “Feskekorka” in the shape of a church! Loved strolling the markets of Sweden. Oslo is Natalie’s favorite Scandinavian city. It’s smart, sophisticated and easy to navigate. The Opera House’s design is modeled after an iceberg and you can scale the sloped roof to have a great view. It location on the water and it’s asymmetric shape makes it appear as if it is floating. Other attractions worth a visit in Oslo include the sculpture garden and Viking Ship Museum. It was worthwhile to buy the 24 hour unlimited metro pass to easily get around the large city via the tram system. Additionally, the metro pass includes the ferries. Taking a round trip ferry tour on the archipelago is a great way to see a glimpse of how the Norweigans spend time outdoors in their small cabins during the summer months. 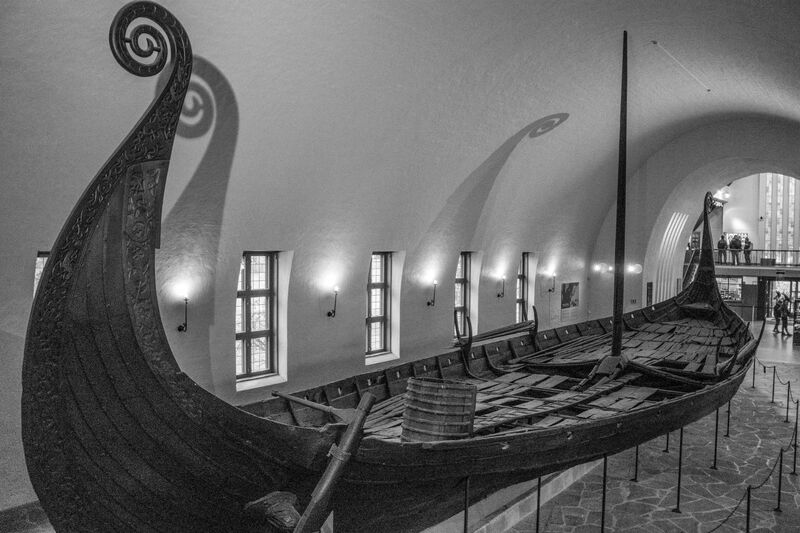 Viking Ship Museum, Oslo, Norway. The Aker Brygge and Tjuvholmen areas were a spectacular display of cutting edge Scandinavian design on a picturesque setting on the Skagerrak strait, connecting the North Sea and Kattegat Sea, leading to the Baltic. This area reminds Natalie of modern Japanese design with its clean lines, functionality and sophisticated style in a quiet setting. Aker Brygge in Oslo, Norway. Oslo’s Akershus Fortress had spectacular views within and all around the city. Additionally, it was peak season in autumn and the leaves were changing which made it very picturesque to walk around. 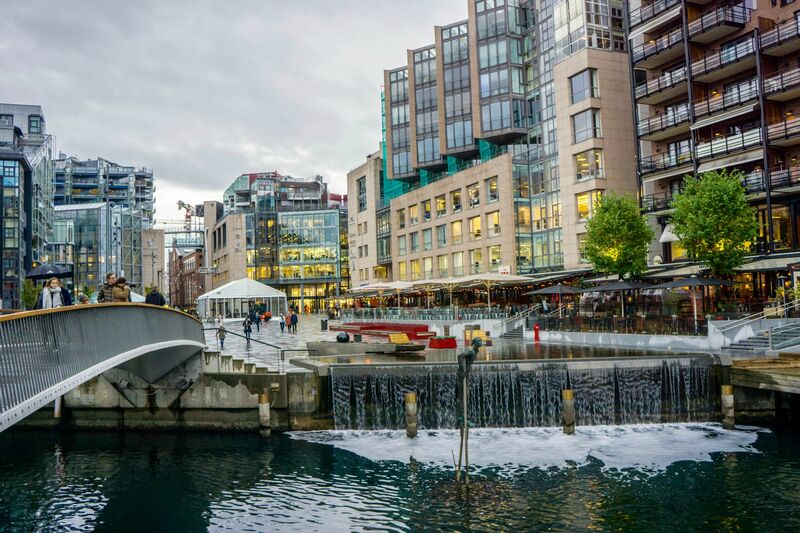 The Grunerlokka neighborhood was very hip and cool, with great boutiques, the Mathallen Oslo market, a riverwalk with waterfalls and excellent coffee. The last city visited was Stockholm, Sweden which has an old European city center and is known for it’s amazing Swedish meatballs with lingonberries! Natalie had some delicious ones at Gastabud Restaurant and she highly recommends this quaint place in the old town with great service, atmosphere and food. It was fun to get lost down the tiny alleyways and enjoy a cup of hot chocolate at Kaffekoppen to keep warm, be sure to check out their basement! Stockholm’s Sodermalm neighborhood is more up-and-coming and can be compared to the Haga district of Gothenburg or the Grunerlokka neighborhood of Oslo. Scandinavia was an incredible place to visit aslo required a bit more planning on a tight budget! Next, it was time to meet Josh in more affordable Berlin.